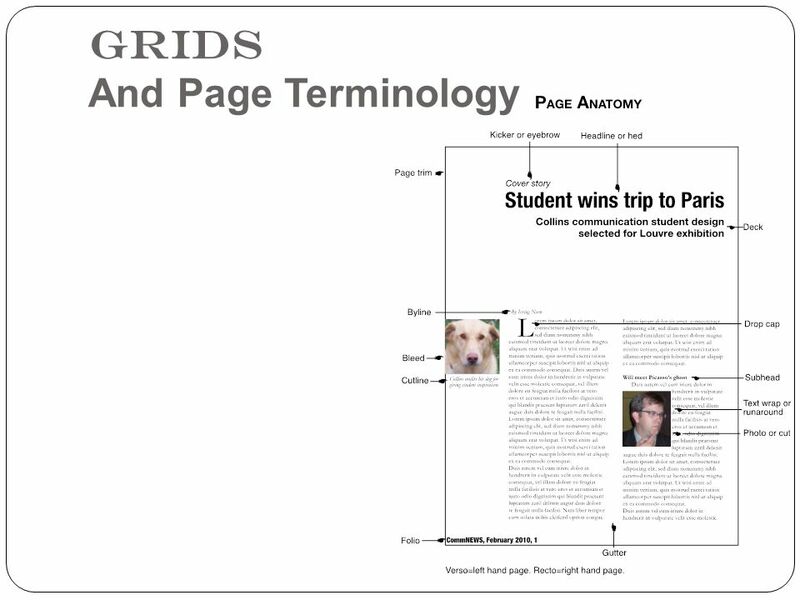 And Page Terminology Grids. 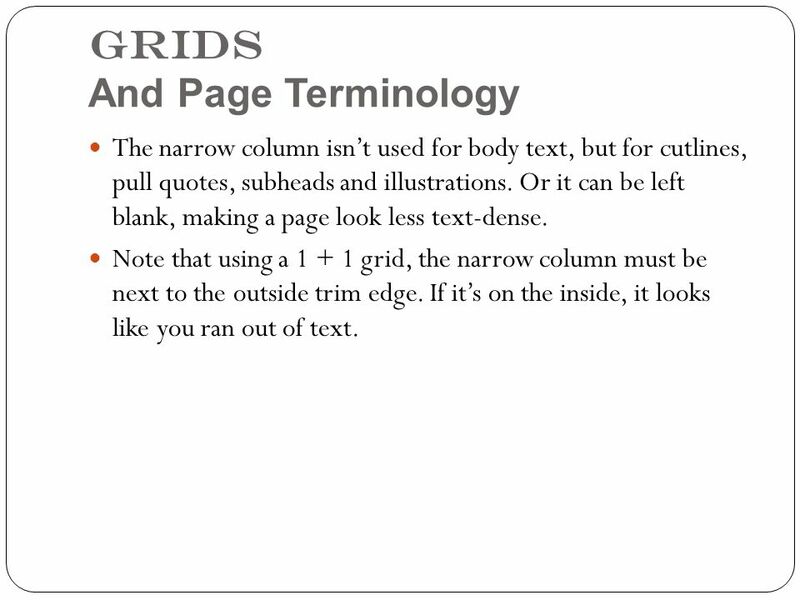 Grids And Page Terminology A grid is simply a series of non-printing lines used to help organize elements on a page. 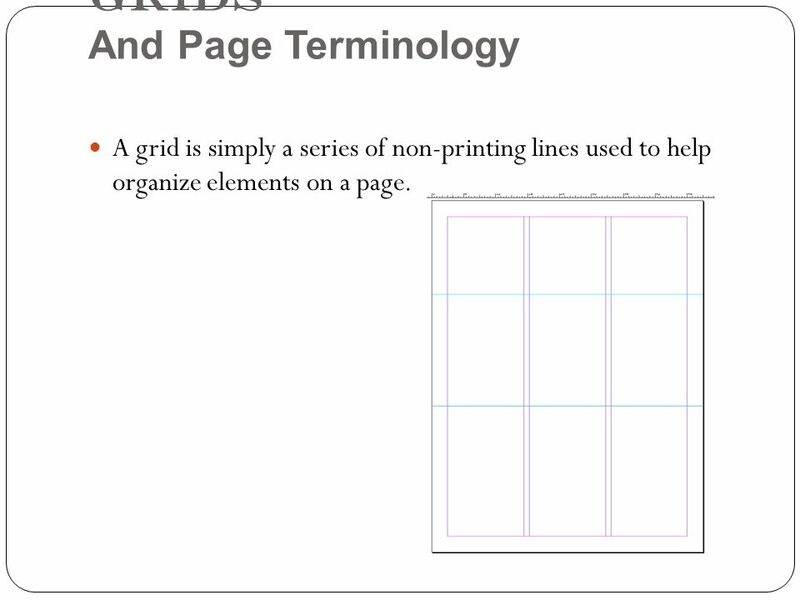 2 Grids And Page Terminology A grid is simply a series of non-printing lines used to help organize elements on a page. 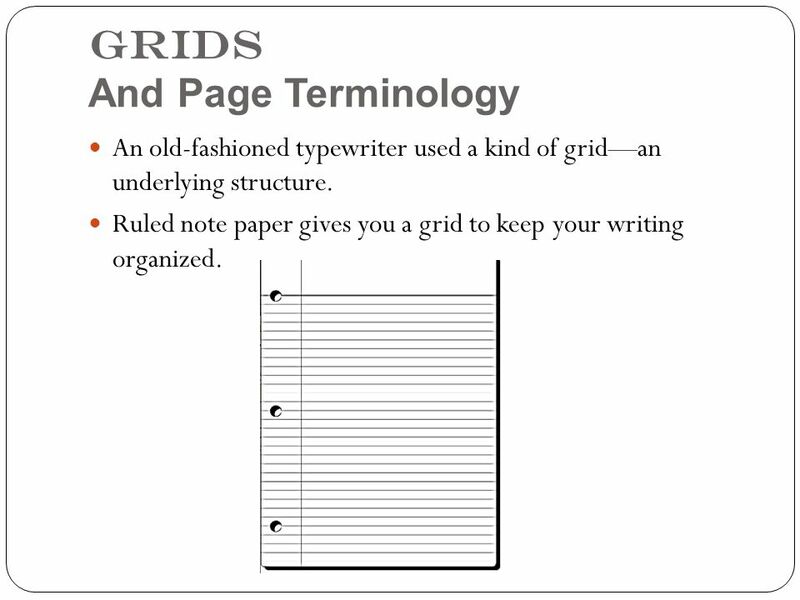 3 Grids And Page Terminology An old-fashioned typewriter used a kind of grid—an underlying structure. Ruled note paper gives you a grid to keep your writing organized. 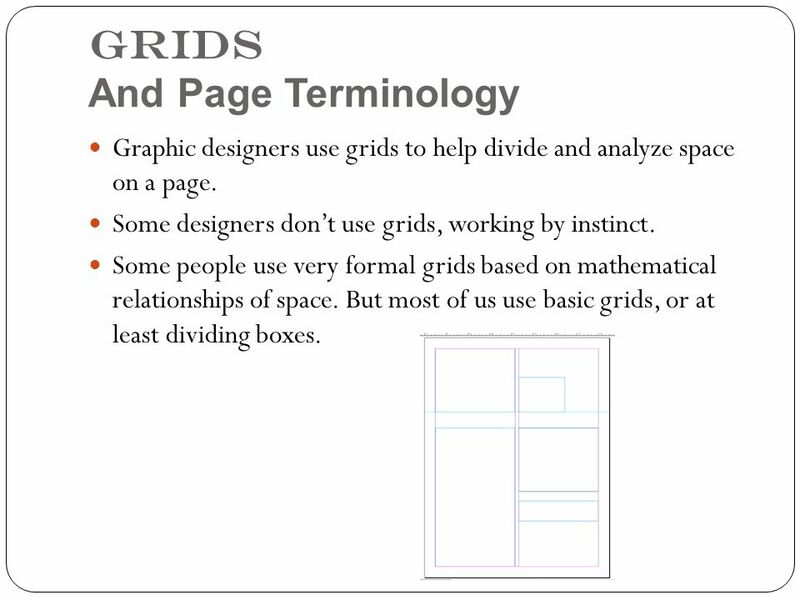 4 Grids And Page Terminology Graphic designers use grids to help divide and analyze space on a page. Some designers don’t use grids, working by instinct. Some people use very formal grids based on mathematical relationships of space. But most of us use basic grids, or at least dividing boxes. 7 Most designers begin by choosing a standard grid. A one-column grid is most simple. Its “quiet” design gives a publication a business-like appearance for reports, proposals, press releases or internal communications. 8 Grids And Page Terminology A 1-column grid. 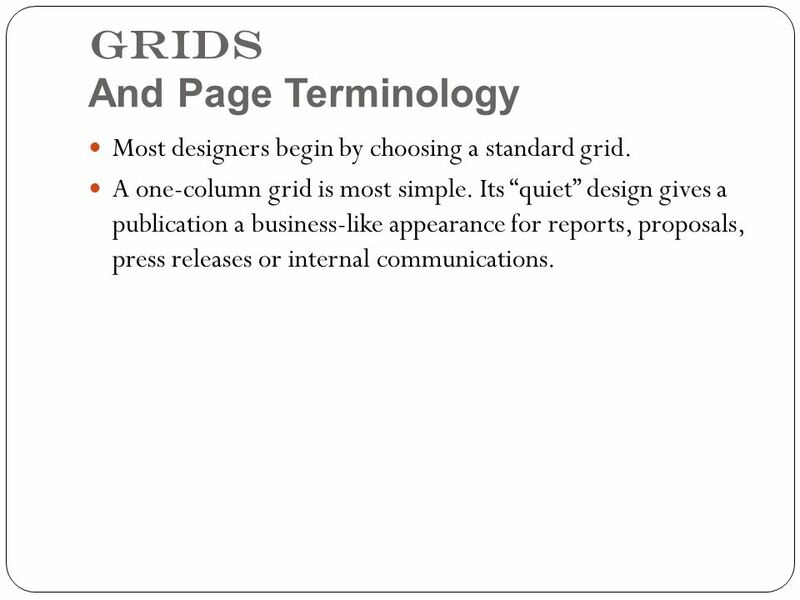 9 Grids And Page Terminology But a 1-column grid doesn’t give a designer much flexibility, or allow for much variety. A wide one-column grid is easy to design, gives a designer an interesting way to add subheads or illustrations. But usually if you want to add substantial amounts of text to the narrow column, you’ll want to go with a 1 + 1 grid. 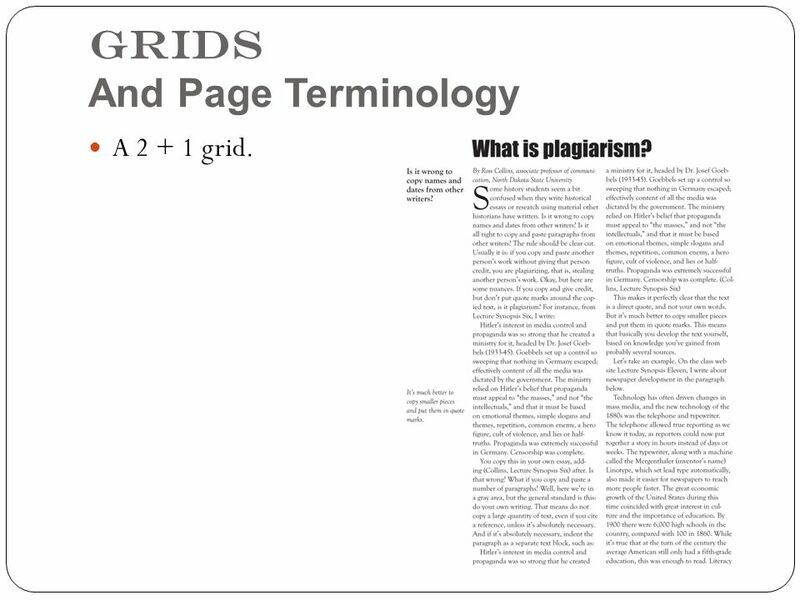 10 Grids And Page Terminology A 1 + 1 grid. 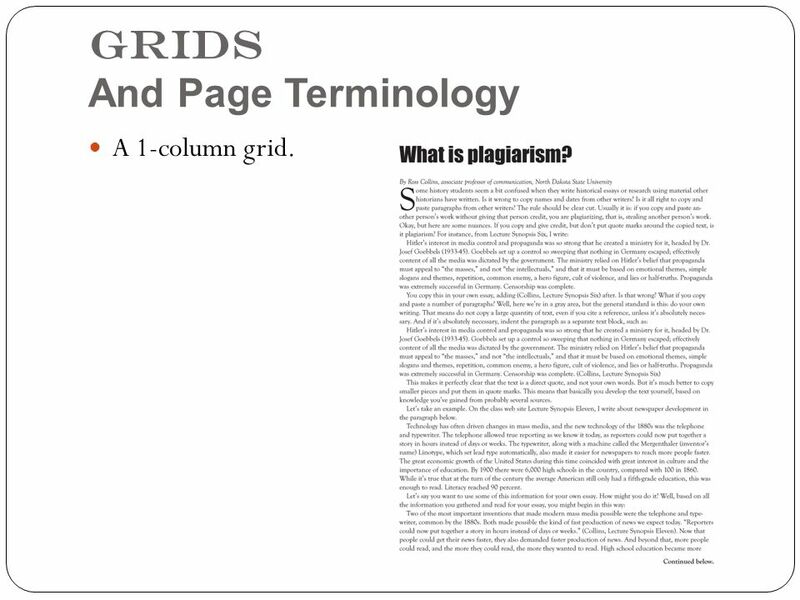 11 Grids And Page Terminology The narrow column isn’t used for body text, but for cutlines, pull quotes, subheads and illustrations. Or it can be left blank, making a page look less text-dense. Note that using a 1 + 1 grid, the narrow column must be next to the outside trim edge. If it’s on the inside, it looks like you ran out of text. 13 1 + 1 is handy, but 2-column grids have a more polished, designed feel. All sorts of smaller-format publications use a standard 2-col, including books, magazines and newsletters. 14 Grids And Page Terminology A 2-column grid. 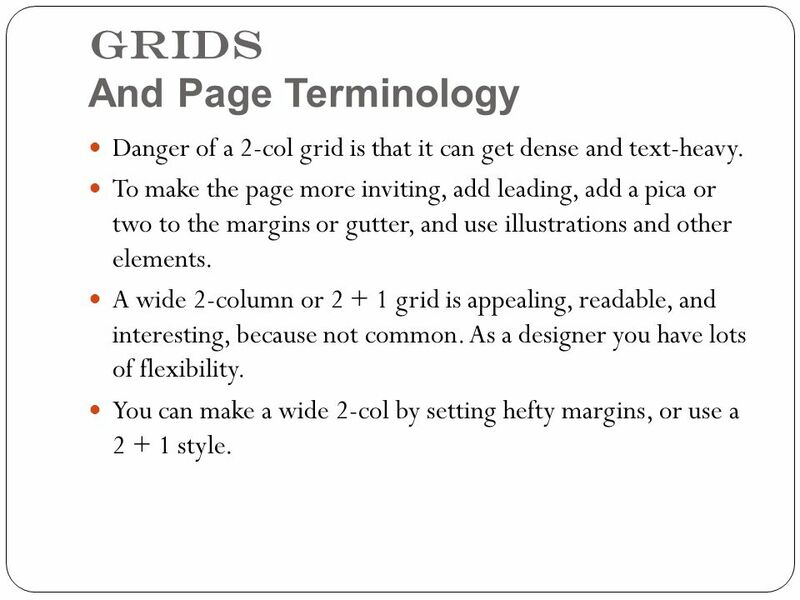 15 Grids And Page Terminology Danger of a 2-col grid is that it can get dense and text-heavy. To make the page more inviting, add leading, add a pica or two to the margins or gutter, and use illustrations and other elements. A wide 2-column or 2 + 1 grid is appealing, readable, and interesting, because not common. As a designer you have lots of flexibility. You can make a wide 2-col by setting hefty margins, or use a 2 + 1 style. 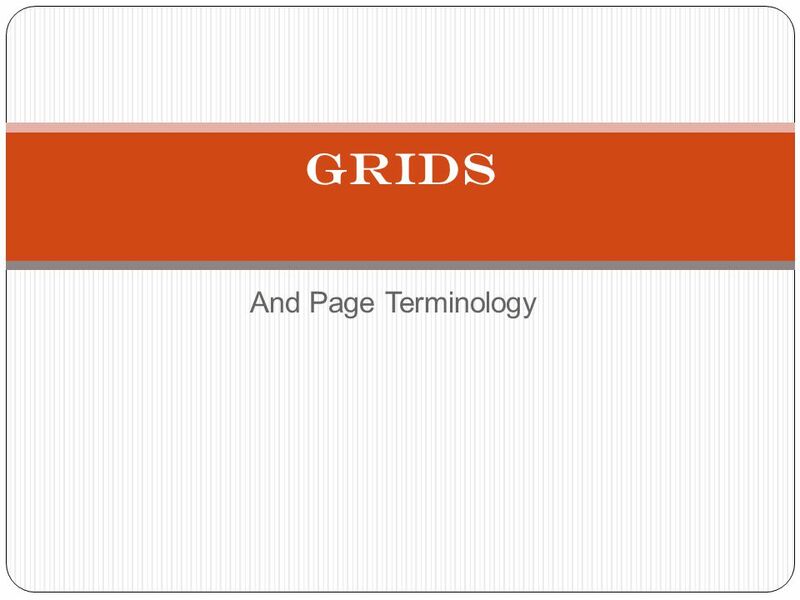 16 Grids And Page Terminology A 2 + 1 grid. 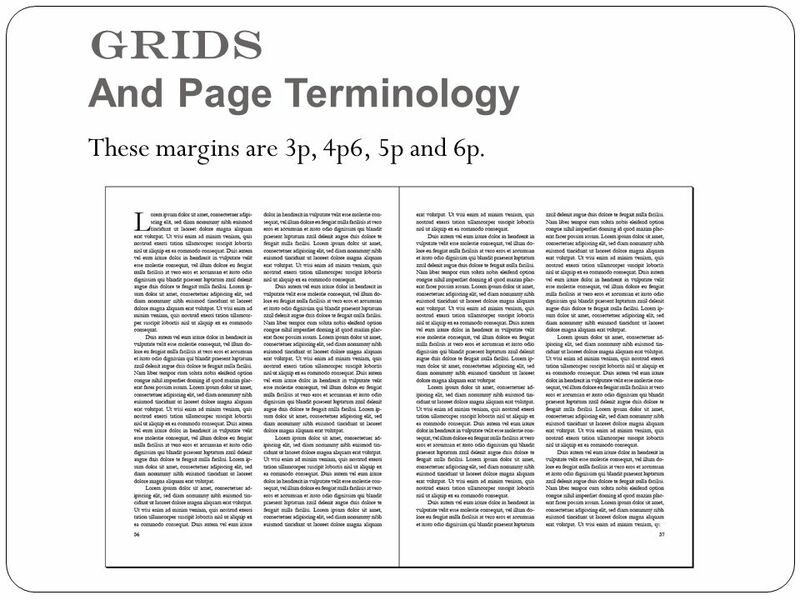 17 Grids And Page Terminology Of course, wide margins and narrow columns take up space, and add pages to a publication that already might be large and costly to produce. A 3-column grid uses space efficiently, and offers great flexibility to a designer. 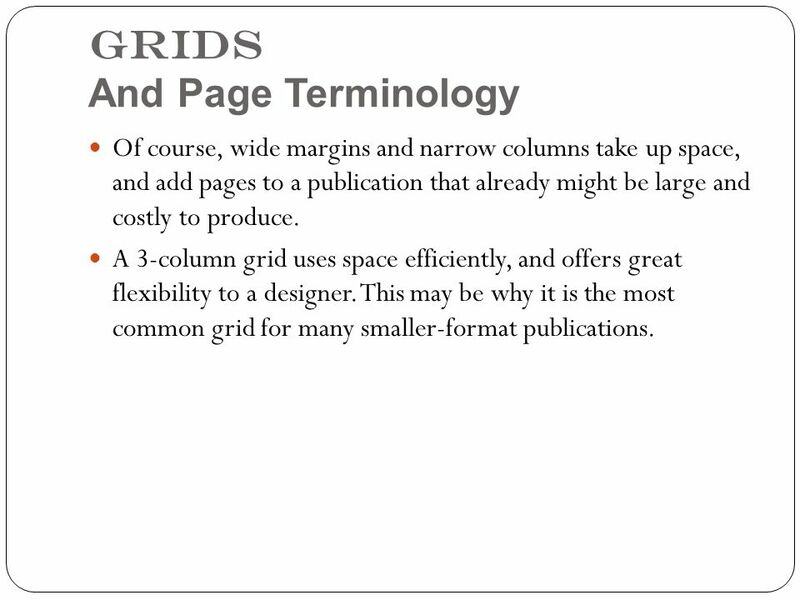 This may be why it is the most common grid for many smaller-format publications. 18 Grids And Page Terminology A 3-column grid. 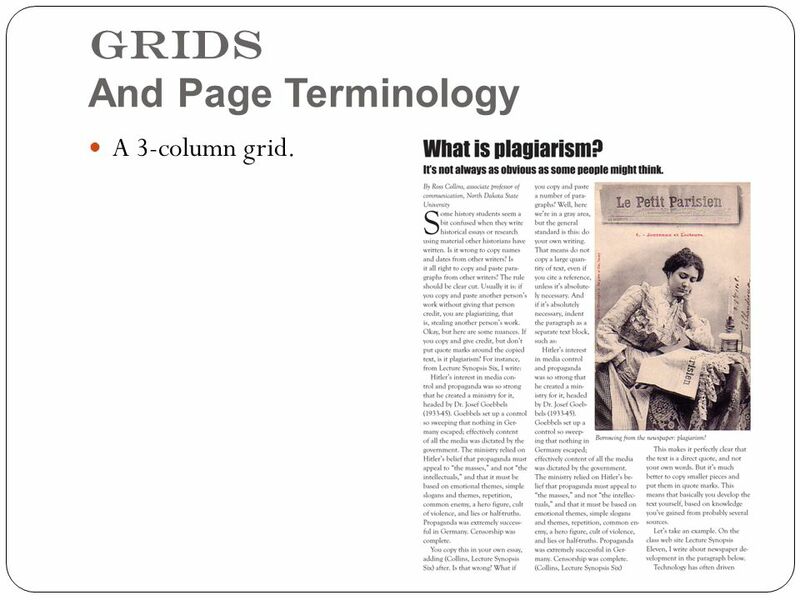 19 Grids And Page Terminology 3-col grids are so common, however, that they don’t add a distinctive feel to your page. Larger format publications, such as tabloids and broadsheets, usually rely on 5-column and 6-column grids; 4-column grids are less common. 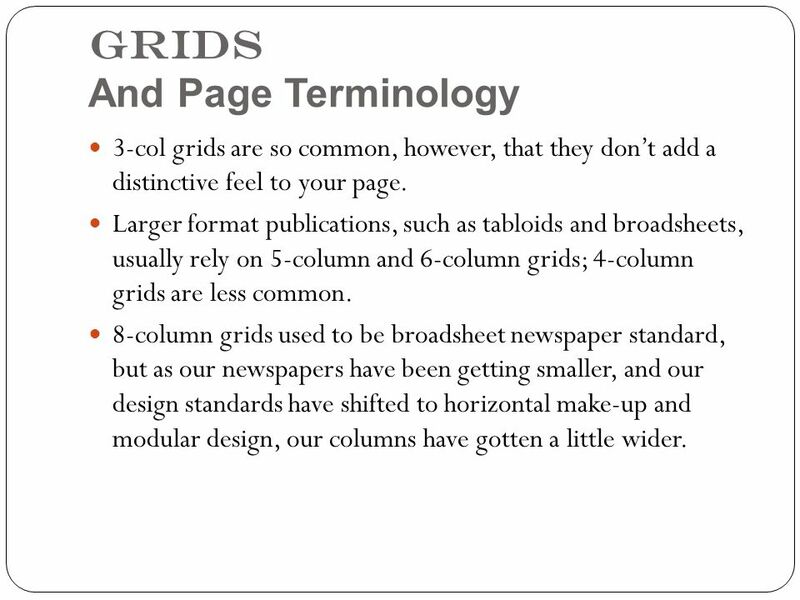 8-column grids used to be broadsheet newspaper standard, but as our newspapers have been getting smaller, and our design standards have shifted to horizontal make-up and modular design, our columns have gotten a little wider. 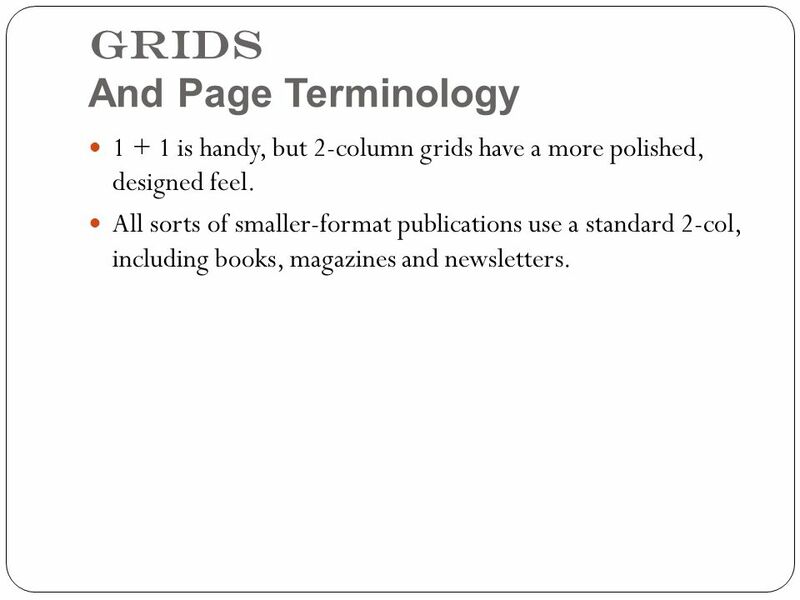 20 Grids And Page Terminology A 5-column grid. 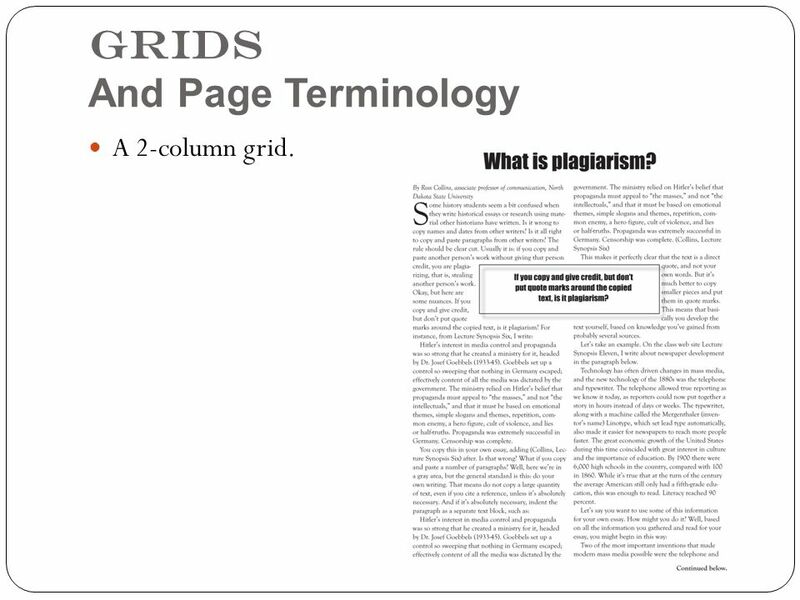 21 Grids And Page Terminology Recall that a tabloid format is simply a broadsheet (large newspaper) turned sideways and folded in half. Large-format pubs emphasize modular design. This means all stories are fit into a rectangular (“modular”) format, instead of an L-shaped or “dogleg” format around advertisements, photos, or other elements. 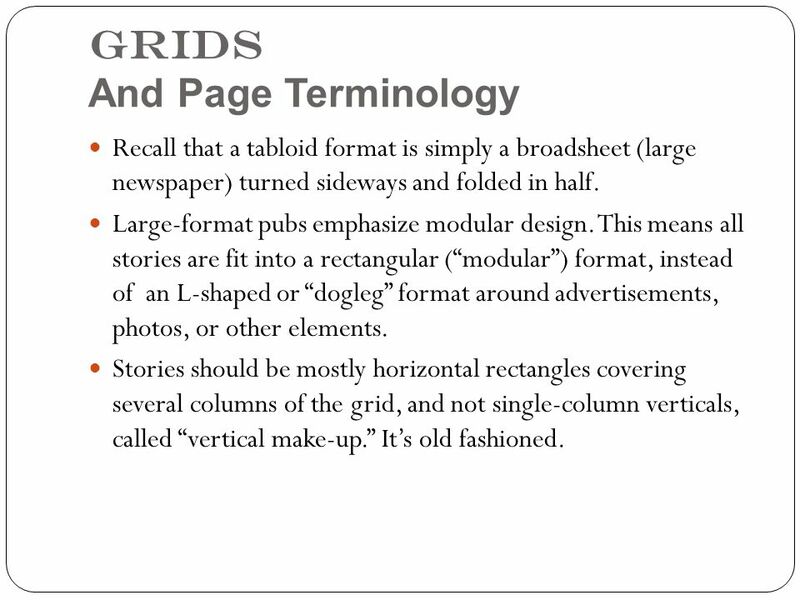 Stories should be mostly horizontal rectangles covering several columns of the grid, and not single-column verticals, called “vertical make-up.” It’s old fashioned. 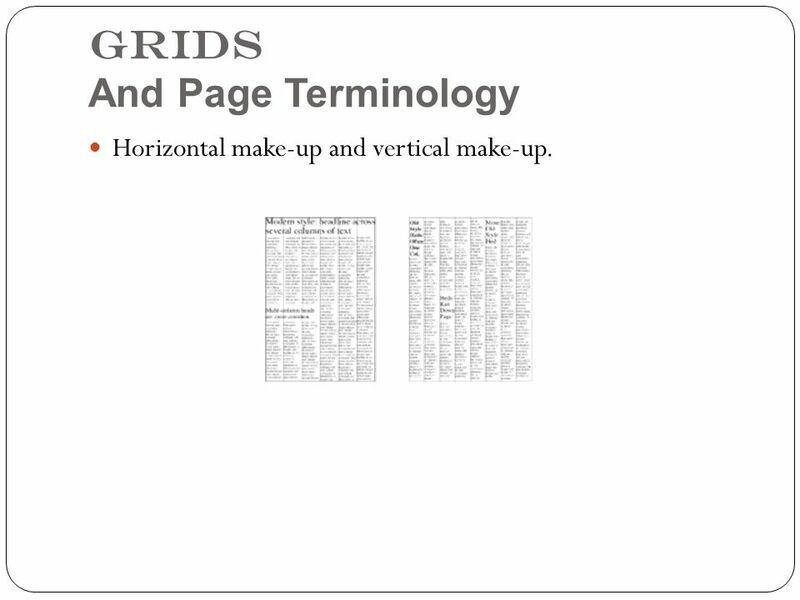 22 Grids And Page Terminology Horizontal make-up and vertical make-up. 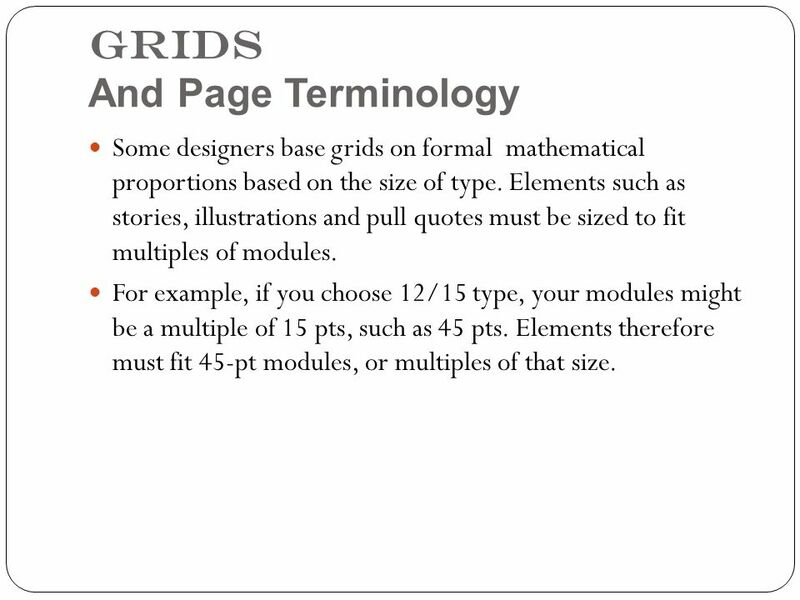 23 Grids And Page Terminology Some designers base grids on formal mathematical proportions based on the size of type. Elements such as stories, illustrations and pull quotes must be sized to fit multiples of modules. For example, if you choose 12/15 type, your modules might be a multiple of 15 pts, such as 45 pts. Elements therefore must fit 45-pt modules, or multiples of that size. 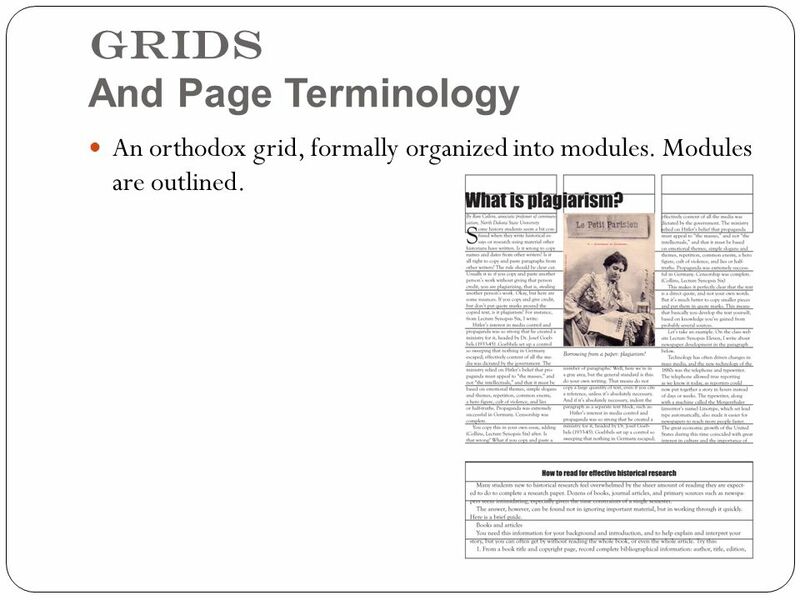 24 Grids And Page Terminology An orthodox grid, formally organized into modules. Modules are outlined. 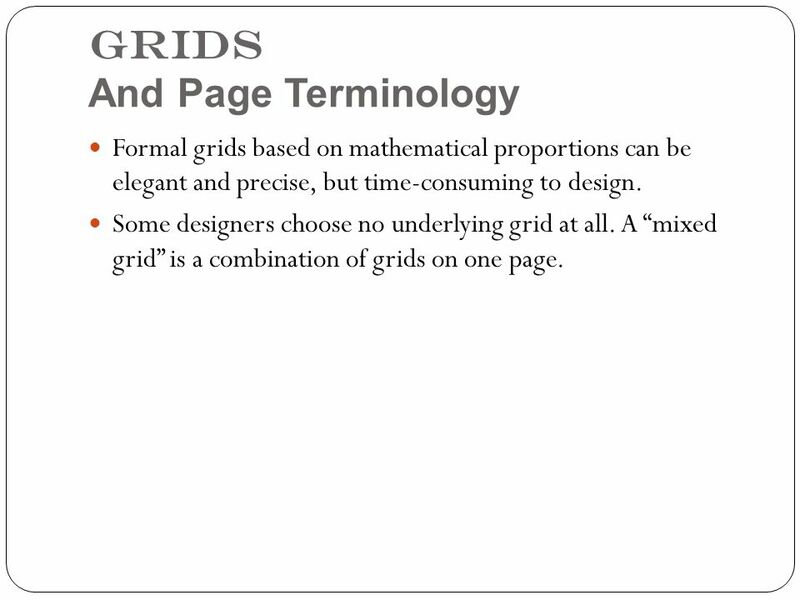 25 Grids And Page Terminology Formal grids based on mathematical proportions can be elegant and precise, but time-consuming to design. Some designers choose no underlying grid at all. 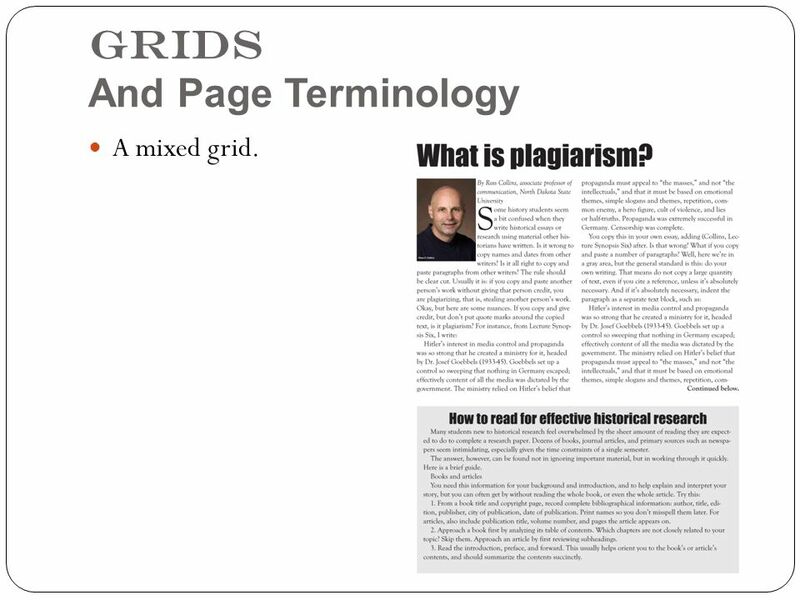 A “mixed grid” is a combination of grids on one page. 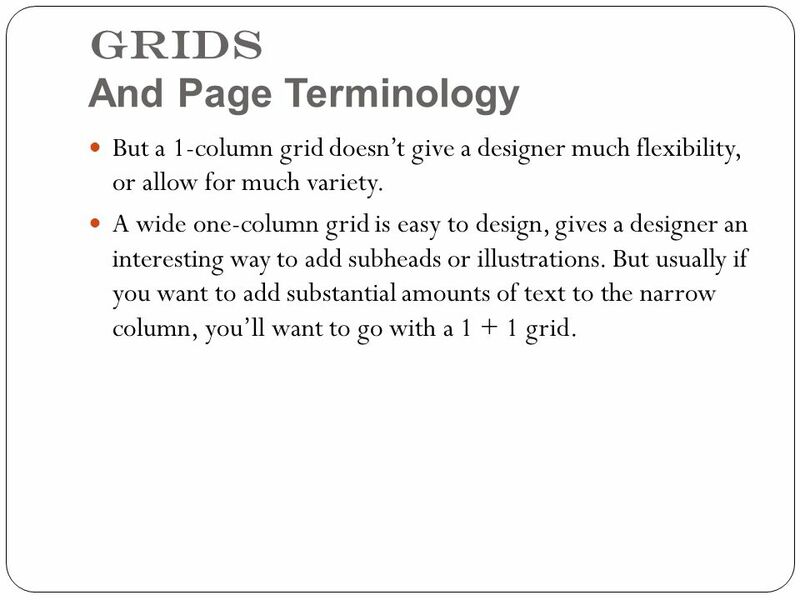 26 Grids And Page Terminology A mixed grid. 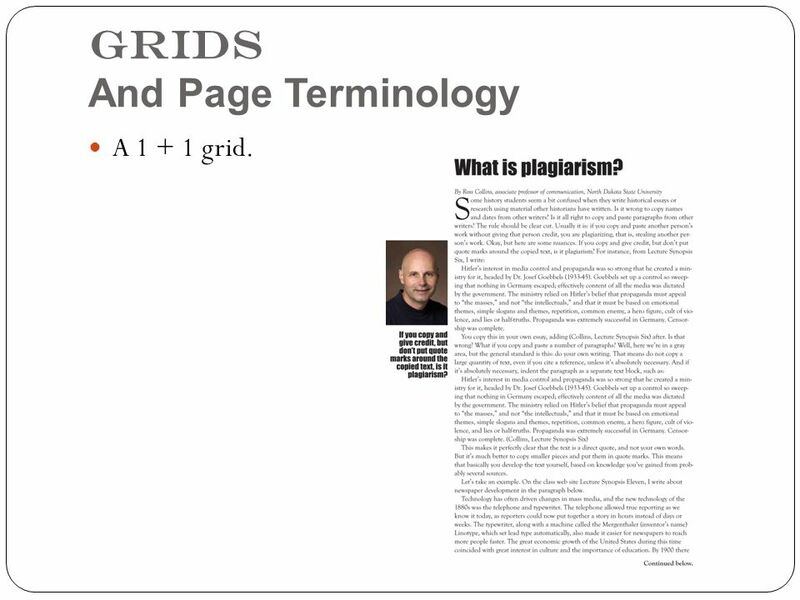 27 Grids And Page Terminology Mixed grids or “collage style” can be effective if you are an experienced designer. They can look chaotic if you are not. Use sparingly. 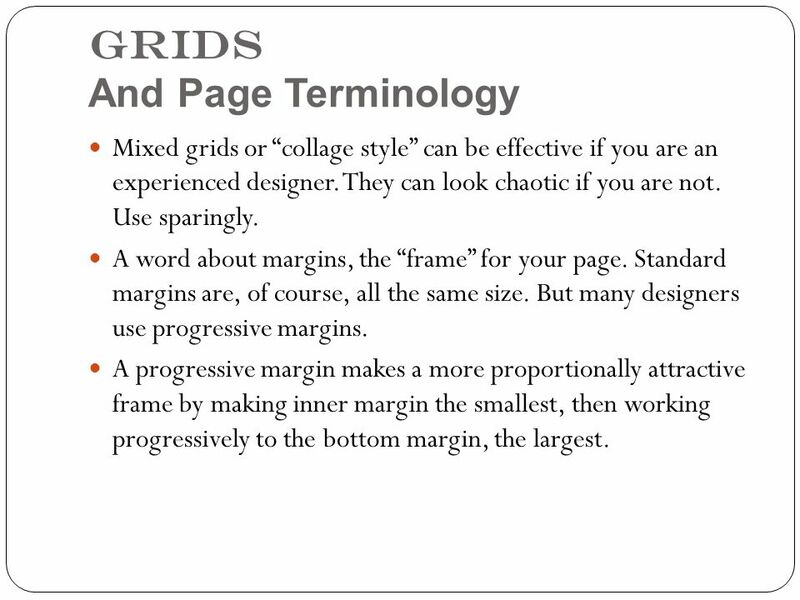 A word about margins, the “frame” for your page. Standard margins are, of course, all the same size. But many designers use progressive margins. A progressive margin makes a more proportionally attractive frame by making inner margin the smallest, then working progressively to the bottom margin, the largest. 28 Grids And Page Terminology These margins are 3p, 4p6, 5p and 6p. 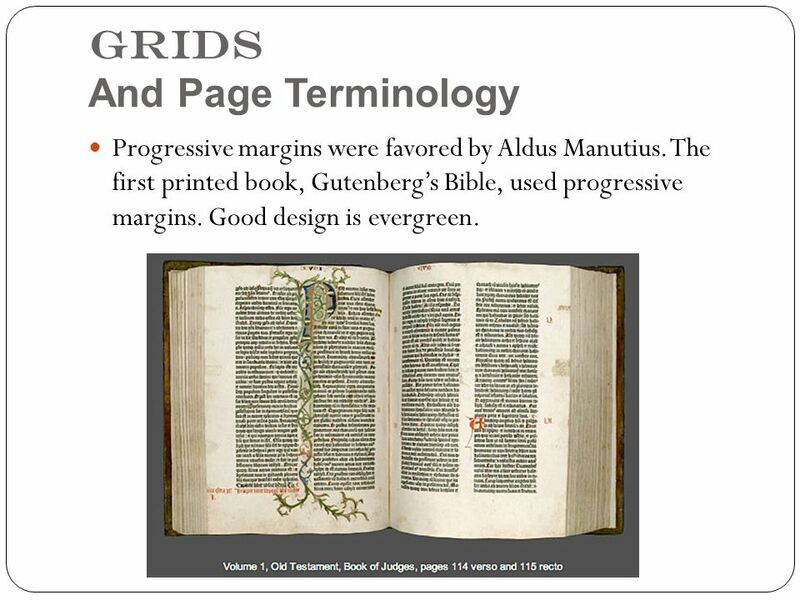 29 Grids And Page Terminology Progressive margins were favored by Aldus Manutius. The first printed book, Gutenberg’s Bible, used progressive margins. Good design is evergreen. 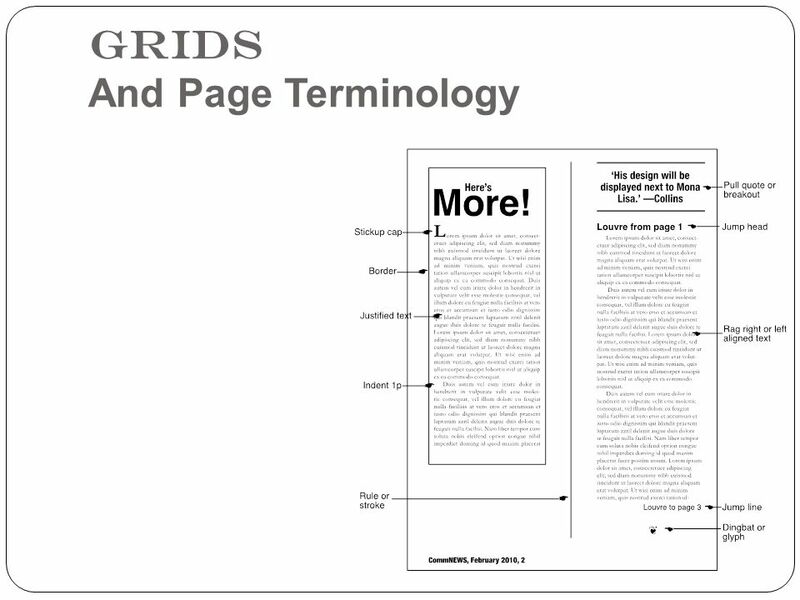 Download ppt "And Page Terminology Grids. 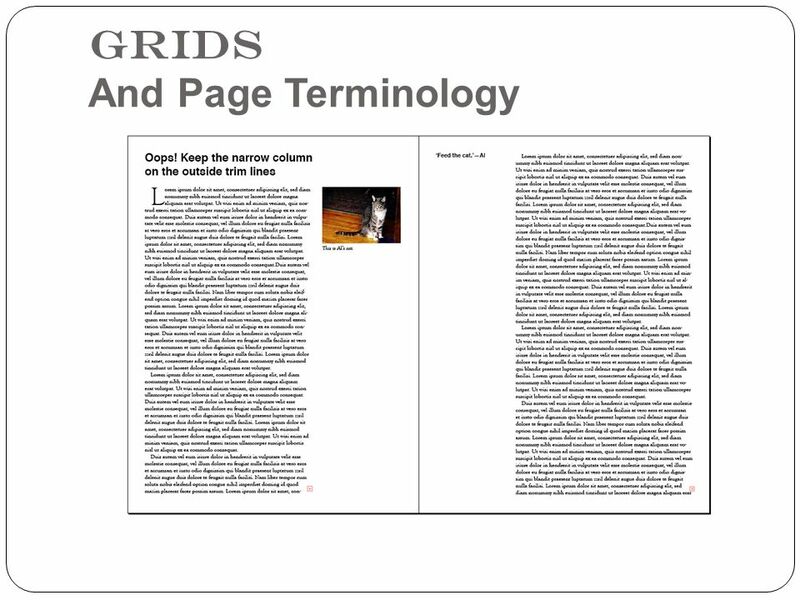 Grids And Page Terminology A grid is simply a series of non-printing lines used to help organize elements on a page." Microsoft ® Word 2010 Training Create your first Word document I.
I SSUES and D ESIGN features in Desktop Publishing Making a document Stand out! Ms. Scales. How the edges of a line, paragraph, object, or table are positioned horizontally and vertically between the margins or on a page. 1 Word Lesson 5 Formatting Paragraphs and Documents Microsoft Office 2010 Introductory Pasewark & Pasewark. T Y P E L A Y O U T. Old Design Know the rules before you break the rules. W I S D O M ________________________________________. YEARBOOK DICTIONARY Words to Know… So you know what I’m Talking about. Basics of Page Design. Page designers want readers to be able to proceed in an orderly manner as they scan page and move effortlessly from story to story. Adobe PageMaker 6.5 Intermediate Level Course. Master Pages Palette The Master Pages palette allows you to create and apply Master Pages to Publication. Designing Newsletters b Consider: b Audience b Cost b Frequency b Size b Artworks and formats b Shape. Layout and design of tabloids and broadsheets..  Some designers are daunted when facing the seemingly enormous expanse of white space available in a. How to Create a Professional Magazine Layout Handout-16. Objectives Gain knowledge of mathematical ratios and proportional systems Learn about the use of the grid. 1.01A – What typefaces should be used for various displays?????  Pica: a unit of measure; 1/6 inch.  Column inch: vertical measurement of text in a column of a newspaper article  Masthead: newspaper’s name found. Microsoft® PowerPoint 2013. 2 3  From the Insert tab, in the Tables group, click the Insert Table button.  Drag your pointer down and across to define.